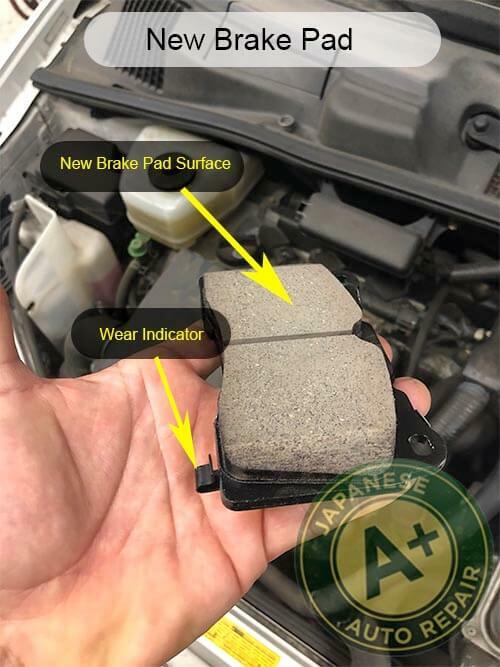 Brake Repair Experts - A+ Japanese Auto Repair, Inc.
A+ Japanese Auto Repair employs expertly trained Brake Repair & Service mechanics. If you have any brake questions please contact our staff or stop by today to speak with a brake repair & service professional. Our facility offers same day brake repair & service. Industry trained brake repair & service professionals. Open / Transparent Process - including photos - helping you understand any recommendations. Peace of mind - 24-month / 24,000-mile warranty. A+ Japanese Auto Repair specializes on brake repair & service in San Carlos. Below are answers to commonly asked brake repair or service questions that we get from our brake repair clients. If you'd like to book an appointment for a brake inspection, need any other questions answered about brake repair or service that are not listed in the text below, please feel free to call us at 650-946-1856. Do you want to learn more about brakes? What does the brake warning light mean on my dash? Why does my steering wheel shake when stepping on the brakes? What is a brake fluid flush? How often do I need to change my brakes? What are the symptoms of worn brakes? The symptoms of worn brakes are shaking upon braking, brake squealing, and brake grinding. Each braking symptom indicates a different issue with the braking system but all symptoms require immediate attention by a certified mechanic. Some further information on why these symptoms occur can be ascertained in figure A. In Figure A. you can see a set of used brake pads with multiple issues due to wear. The glazed or glassy looking surface is an issue that occurs as brake pads wear and have been overheated. Overheating of brakes can be due to hard braking down hill, riding the brakes, panic stops, etc.. Brakes can also overheat due to the brake pads or rotors being low on material and not being able to dissipate heat properly. The reference to heat cracks and pitting shows that there was a braking instance that caused a pad surface failure due to the brakes heated up so much the material cracked. And lastly the item referred to as the metal wear indicator is a tab of sheet metal that protrudes in the direction of the friction surface off of the brake pad backing. The purpose of the wear indicator is to alert the driver with an audible warning when the pads get low. 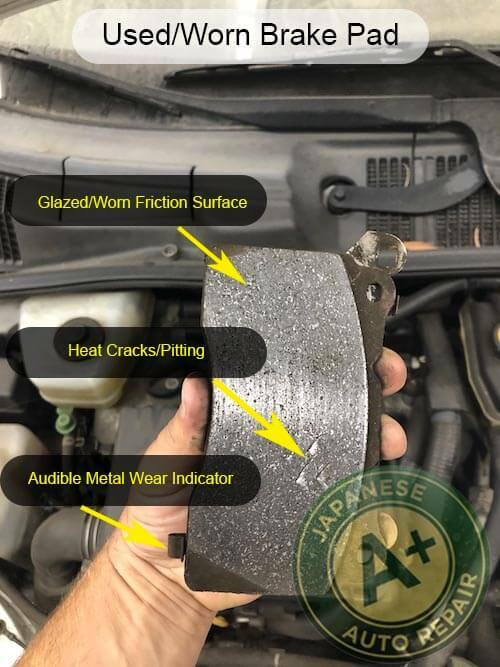 When the friction surface on the brake pads in figure A. wear down there will be a point where this sheet metal tab touches the rotor and makes an audible warning that sounds like a screeching to alert drivers that the pads are low and in need of replacement. Figure B. shows a set of new brake pads that has none of the issues discovered on the brake brake pads in Figure A. How much does a brake job cost? On average, a “brake job” would consist of replacement of brake pads and brake rotors on either the front or the rear, which will cost between $400 - $600. There are many other factors to determine how much a brake job will cost beyond the normal range above. We recommend to start with a brake inspection to determine which brake components need to be changed. 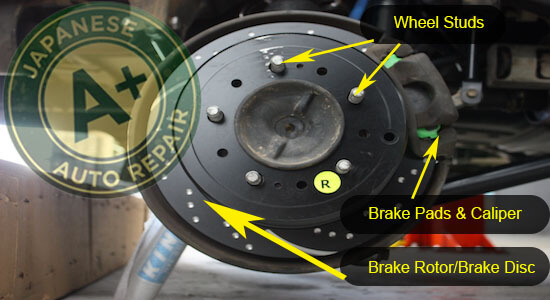 Then determine what type of quality brake components you’d like installed on the vehicle. These factors will also change the cost of a brake job. What should be checked during a brake inspection? We put together a list to help you understand if you need new brakes. The brake warning light stays on the dash while driving. Squealing is heard from the brakes while reversing the vehicle. The steering wheel shakes while applying the brake pedal. You can hear grinding or squealing when applying the brake pedal. Always check to see if you need a brake fluid flush when you change your new brakes! Where do I get my brakes repaired near San Carlos? A+ Japanese Auto Repair is the best brake repair shop in the San Carlos, Redwood City, & Belmont area. 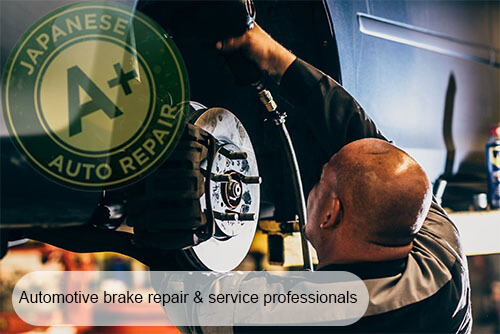 A+ Japanese Auto Repair are the brake repair experts. We offer the peace of mind that you and your family will be safe when using your brakes. We use the highest quality brake pads, brake rotors, brake master cylinders, wheel cylinders, and other brake related auto repair components. 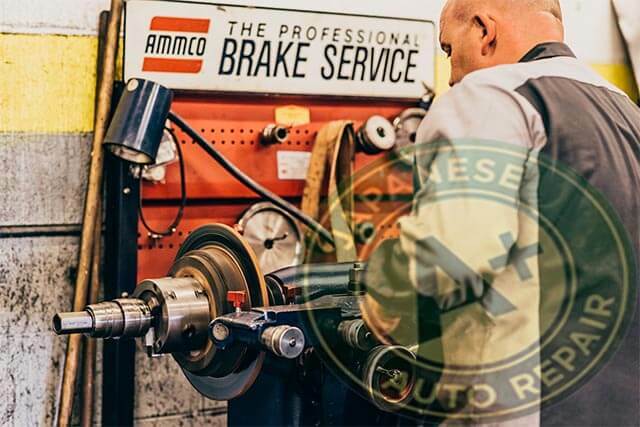 Our ASE brake certified mechanics and years of experience working with all kinds of brakes allow us to offer clients of A+ Japanese Auto Repair in San Carlos our 24 months / 24,000 miles warranty on all brake service & brake repair. What type of vehicle brakes do you work on? A+ Japanese Auto Repair in San Carlos specialize on and have been trained on brake repair for Honda, Acura, Toyota, Lexus, Nissan, Infiniti, Mazda, Subaru, Mitsubishi, Scion, Isuzu, Kia, Hyundai and Hybrid Vehicles. If you have any further brake questions or would like some help with brake repair or service, please feel free to call us at 650-946-1856, text us at 650-750-8233, or make an appointment.